KIVOS Rechargeable Sonic Electric toothbrush with travel case: ultrasonic technology with 380,000 vibration/min removes up 7 times more plaque than manual brush; 2 brush modes:Clean,White(+/- 3 Grades Speed),suit for different Home oral care，Includes 2 Replacement brush heads. Electric toothbrush for adults with smart timer: 30 seconds alerting to know when to switch; 2-minute auto-off timer ensures recommended brushing time by dentist. Rechargeable toothbrush with wireless inductive charging technology with Li-ion Battery enables 30 days lifetime of two-time use per day for one full charge. Sonicare Electric Toothbrush with UV Sanitizer: kills 99.99% germs& bacteria in bristle in 10 minutes;90 days money back and 1 Year warranty. Health & Safety Standard:2pcs Food Grade Dupont brush heads of 0.15mm bristles which reminder bristles fade to ensure you know when it is time to replace them. CE, ROHS, FCC & FDA approved and has passed dentist’s official health and safety standard. 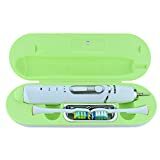 KIVOS sonic electric toothbrush with uv sanitizer for adults, use the newest micro Magnetic suspension 3D movement,improve oral health for long term use. Replacement Heads:2 dupont toothbrush heads,PP FOOD Grade. USB charging with UV Sanitizer,terilize 10 minutes,kill 99.9% bacteria. First time charge,please charge 12 hours.the second time, please charge 6 hours. KIVOS recommends clean mode at the 1st speed class if you are new to sonic electric toothbrush. before you turn on the sonic electric toothbrush to avoid toothpaste spraying. Please turn the electric toothbrush off before taking out from mouth to avoid toothpaste spraying. Dentists suggest 2 minutes toothbrush time and replace electric toothbrush head at least every 3 months.